Many have never seen a sturgeon in person, much less caught one. Those lucky enough to catch one usually do so on the Missouri river or some other ancient running body of water. 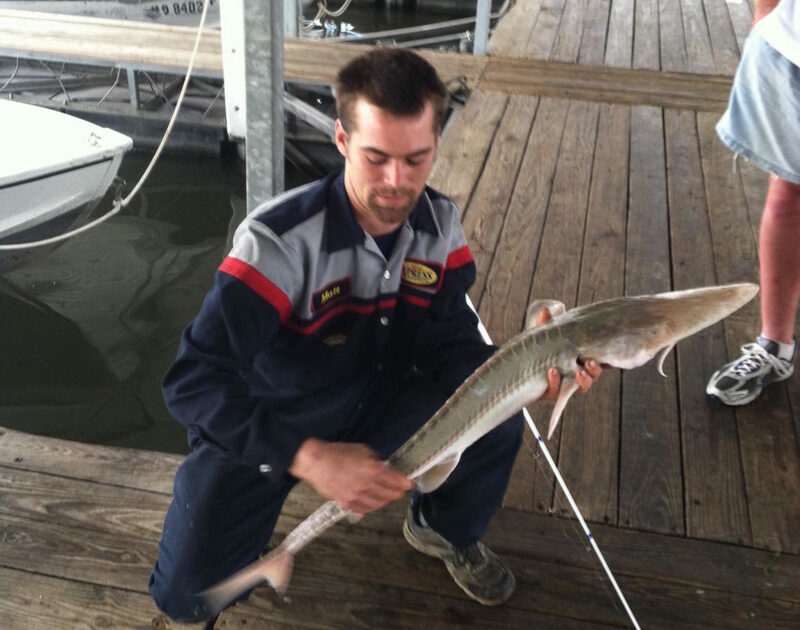 So when a sturgeon is caught from a local lake like Longview, a thirty plus year old man-made lake in Lee’s Summit, MO, it’s worth taking a moment to ponder the situation. First, sturgeon typically feed on the bottom looking for crayfish, snails, and other small bottom-dwelling creatures. So, catching this sturgeon from the marina three feet below a bobber with a minnow is impressive. The second fact we need to consider is that Longview Lake is a man-made lake that never had sturgeon stocked. So how did one get in? There are two theories on how the rare fish came to live in Longview. The first is that it was caught in the Missouri River and dumped in the lake. While this theory is possible, it’s unlikely because the sturgeon would suffer severe stress and probably die being transported to the lake. Plus, the estimated age of the fish is anywhere from fifty to one hundred years old (some sturgeon even live to be one hundred and fifty!). The fish could indeed be older than the lake it now calls home. This is a good point; however, before the dam was built and water filled the area, a small river channel (the Little Blue River) ran through the now nine hundred and thirty acre lake. If you trace it far enough you eventually end up at none other than the Missouri River. After a conversation with Jake Allman, the biologist for Longview Lake, we realized there might be a more plausible scenario. The sturgeon could have swam from the Missouri River, through the Little Blue River channel, to what is now Longview Lake. The rare fish most likely stayed in the river while the dam was built and rode the water up as the lake filled. This would explain how such an old sturgeon like this one made it into the lake. It’s incredible to think about the life this old fish has lived. To make such a long journey and survive is impressive. It’s amazing to wonder, with so many fishing lines in the water at Longview, how he had not been caught sooner. Fishing, Lee's Summit, Longview Lake, Mahoney Outdoors, Sturgeon. Bookmark.